Safety Cabinets Ship Free in the Continental USA! Pesticides present a substantial danger to people and the environment when improperly stored. 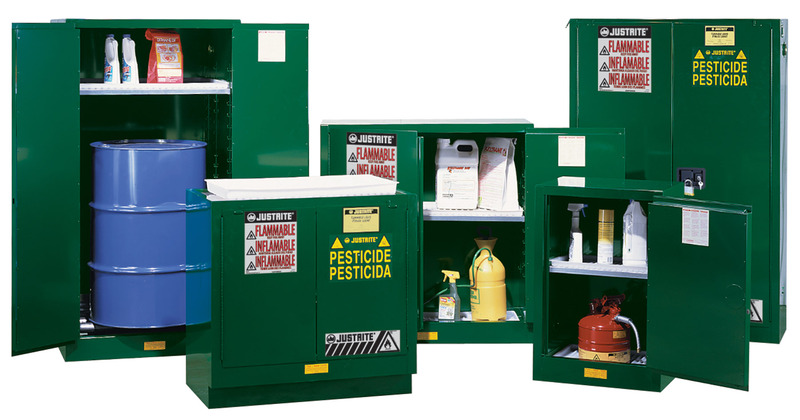 Safety cabinets that are specifically designed to house these types of chemicals offer features including: sturdy double wall, 18-gauge steel construction with 1.5" of air space and dual flame arresting vents. Three-point automatic latch with keyed lock prevents unauthorized access. Steel shelves, fitted with corrosion resistant polyethylene trays, are adjustable on 2.25" centers to accommodate a wide variety of containers.